This detached holiday home is located on the edge of the forest and is the perfect base for fun holiday trips. The interior is very well maintained and has great ambiance and the natural stone walls ensure that the indoor temperature is always nice and cool even during a very hot summer. There is a living room with a distinctive wood beam ceiling and a wooden stove, as well as a gorgeous fire place in the kitchen. The bedrooms are colourful and are equipped with a very charming old school desk. There is a spacious garden with swings and a playhouse for the little ones at the house. The neighbour's sweet donkey loves to be petted and enjoys eating a baguette. 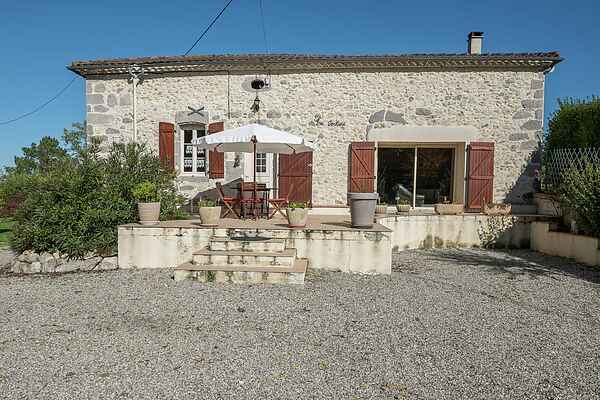 There is a large gravel terrace, perfect for a game of jeu-de-boules, in front of the house. The house has an elevated terrace with a barbecue that is perfect for preparing a scrumptious dinner. Groceries and a market in Clavier (2 km). Bakery, large supermarket and restaurants in Casteljaloux (10 km). Hiking and bicycling trips in the hilly landscape and the forests at Le Mas d'Agenais (9 km). You will find the the recreational lake of Clarens with a sandy beach and paddle boat and canoe rental in Casteljaloux. A true culture aficionado will visit the city of Bordeaux (92 km) with its lovely houses, wine and beautiful quays along the Garonne. There is a golf course at Casteljaloux (18 holes).